The statistics for my WordPress website show that several people have landed on my blog while browsing for information about making flaxseed tea. They are asking this question: Do I have to grind flax seeds when making flax tea? The answer is: you can if you want to, but any form of flax seeds will do. Flaxseed oil, however, cannot be used for making flax tea. Steep 1 teaspoon of whole or ground flaxseeds or 2 tablespoons of flaxseed meal in about 1 cup of boiling water for 10 to 15 minutes. When using a flaxseed tea bag, steep the bag for two to four minutes. Strain the hot liquid and add cinnamon, sugar, honey or lemon as desired. Whole seeds, ground seeds, and finely ground flax “meal” can be used to make flax tea. Flax tea bags are also available. Do an online search of “flaxseed tea bags” for information about a supplier in your area. Walmart and Amazon, for example, sell flaxseed tea bags online. Why can any form of flax seeds be used to make flaxseed tea? The answer: because flax seeds contain mucilage gums. Mucilage gums are a type of soluble dietary fiber that help maintain bowel health, lower blood cholesterol, and decrease blood sugar. The gums sit right on the surface of the seed coat. When whole flax seeds are mixed with hot water and allowed to sit for a few minutes, the mucilage gums float off the seed coat, making the water slightly thick or gummy. When ground flax seeds are used for making flaxseed tea the same thing happens. The gums are still there in the ground flax, it’s just that they have been shredded into very fine particles during the grinding process. I undertook a comparison of the “gumminess” of flax tea made with whole seeds versus ground flax. Flax tea made with whole seeds seemed slightly more viscous, but if I had carried out my test on a Tuesday the result might have been otherwise. No matter the form, flax tea has a delicate nutty flavor which I like. Flaxseed oil cannot be used for making flax tea because it does not contain mucilage gums. 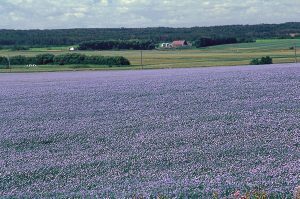 The method for making flax oil requires the seeds to be crushed and as much oil as possible pressed from the crushed seeds. The expressed oil is then refined and bottled, leaving behind a dense “cake” that consists of the rest of the flax seed material, including the mucilage gums, proteins, lignans and the like. A cup of hot flax tea mixed with a dollop of honey is a nice way to help your digestive tract. Yum! And the leftover seeds can be used in making bread or soup. A winner all around. I am trying to get rid of the edema in my feet, anlles and legs. Hi, Carolyn. I am sorry to hear that you are struggling with edema in your legs. I am not an expert in this area, but I have read that there are several things you can do to manage it. First, see your doctor if you have not done so. He or she can examine you to determine what is causing the edema. Secondly, try wearing compression socks (which are available at many drugstores) and putting your feet up on pillows or against a wall for a few minutes every day. Light exercise like walking may also help by stimulating the circulation. There are medications that can reduce edema, but these are prescribed by physicians. 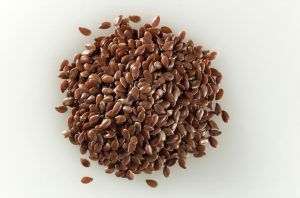 I am not aware of any studies suggesting that flaxseed as a method of managing edema. Do let me know how you get on. Best wishes to you! Sounds like either congestive heart failure or kidney failure to me. The woman should see an MD ASAP!! I agree with you completely, Nick! Unfortunately I never heard back from Carolyn, so I don’t know whether she saw a doctor about her edema. I hope so! Best wishes to you.